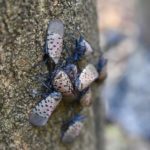 Spotted lanternfly (Lycorma deliculata, SLF) has been found in NJ. SLF is an invasive plant hopper species that could be very devastating to some NJ crops. Since its discovery in Pennsylvania in 2014, SLF has been placed under a state quarantine encompassing 13 Pennsylvania counties. Populations are also present in Virginia. SLF adults and nymphs are phloem feeders that feed in large aggregations on woody tissue. Over 65 host plants were reported in Asia, many of which grow in the mid-Atlantic area. These host plants include hardwood trees such as Tree of Heaven, black walnut, and red maple and agricultural crops such as grape, apple, and hops. Feeding occurs on the trunk and limbs of plants, not on the fruit or leaf tissues. However, because they feed in aggregations and produce large amounts of honey dew (or sugar water), sooty mold can grow on plant surface and fruit, leading to reduced photosynthesis and plant vigor. In Pennsylvania, adults and nymphs have been observed feeding in commercial vineyards on cultivated grape. Economic estimates of injury are not available but growers report direct yield losses due to sooty mold and reductions in plant health and canopy coverage. Insecticides are effective but due to the high mobility of this pest, in highly infested areas, vines should be monitored closely for new bugs. Populations and injury are higher along vineyard edges, especially near Tree of Heaven. Interestingly, SLF tends to aggregate on a few trees or vines. Survey for SLF along the perimeters of fields and on Tree of Heaven, Black Walnut, Red Maple, and wild grapevines at the edges of wood lines. Aggregations of adults were found on commercial apple trees in PA near apples harvest in 2017, so apple growers need to be diligent as well. The adults are large (~1” long) and quite colorful with a black head, grayish black spotted forewings and reddish black spotted hind wings. Adults may start to appear mid-late July (now) and will feed through the first hard freeze in the fall. Young nymphs hatch from eggs in late Spring/early summer and are black with white spots and as they get older they become red and black with white spots. While 4th instars have been reported in NJ, adults are present in VA, so be on the lookout for all life stages.